In the past few years, kickboxing has increased in popularity among both men and women. People participate to lose weight, gain muscle, increase fitness and have fun. Whatever your reasons, it is important to complement your training regime with proper and adequate nutrition. Kickboxing is a high-intensity sport that requires a lot of energy and the main source of this energy is carbohydrates. Carbohydrates are stored in your muscles and liver as glycogen, which your body converts to energy during your workout. It is necessary to include plenty of quality carbohydrates in your diet, such as whole grains, fruits, vegetables and legumes to keep this energy store full. If you exclude carbohydrates from your diet, you won’t burn fat while exercising; you’ll just run out of energy. It is a common misconception that when you work out, you need to increase your protein intake. While it is true that protein is needed to build and repair muscle, most people already exceed their daily protein needs through their regular diet. While animal products, beans and soy foods are well-recognized protein sources, grains, vegetables, seeds and nuts also contribute excellent protein. Not only is what you eat important, but when you eat makes a difference. Eating too much just before your workout can make for an uncomfortable experience. Not eating enough can make it difficult to maintain energy throughout the session. 2-4 hours before your workout: Eat a meal that includes carbohydrate and protein. If your meal is closer to the two-hour mark, be sure it is fairly low in fat and fibre as these both slow the digestion of food and can cause a stomachache during your workout. 1 hour before your workout: If you are short on time, eat a light meal or snack one hour before your workout. Keep this meal low in fat and fibre and high in carbohydrates. After your workout: The two hours after you exercise is when your muscles are most efficient at replacing lost glycogen. Eat a snack or meal that includes carbohydrate and some protein. Below is a post-workout snack with about a third of your daily protein requirement. Vesanto Melina is a registered dietitian and author based in Langley. She is currently involved with the new project www.vancouvercohousing.com. 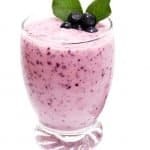 The seeds and fruit in this smoothie provide abundant carbohydrate, protein, minerals, vitamin E and omega 3 fatty acids. For one person, it is a power-packed breakfast that can take you through the morning; others might divide it into two servings. Presoaking the seeds and dates increases mineral availability as well as the smoothness of the final product, though the smoothie is fine without this step. In a small bowl, soak the sunflower seeds and dates in the water for six hours or overnight (optional). Place the seeds, dates, their soaking liquid, the banana, blueberries and hemp seeds into a blender; blend on high speed until smooth. If a thinner consistency is desired, add a little more water. Full recipe: Calories: 584. Protein: 18 g. Dietary fibre: 21 g. Calcium: 85 mg. Iron: 5 mg.